Or we eat pink lemonade cookies. It just depends on our mood. Thanks to Lisa (I told you about her here) for bringing these in today! I'll try to get the recipe and post it later. 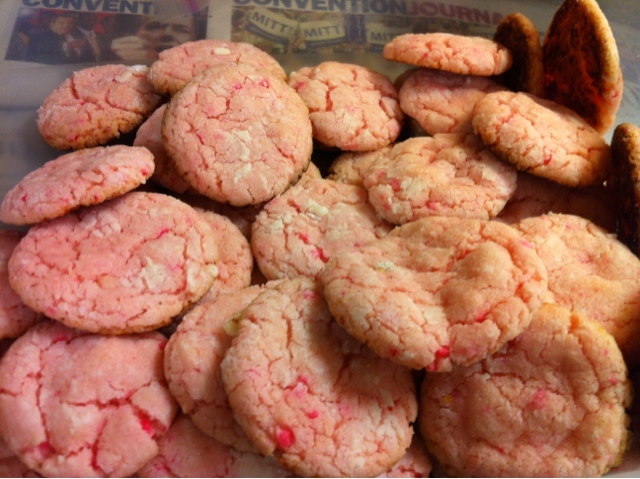 UPDATE: Lisa said she used the Pillsbury Pink Lemonade Cookie mix (directions on the box). She also added 2 packets of Crystal Light Lemonade (just the powder) to make them more lemony. Before putting the cookies in the oven to bake, she rolled them in granular sugar then powdered sugar. Enjoy!